Voligna (vole-ig-na), aka "Sitters", are very strange creatures. Most people don't think they are in the exhibit, but then I tell them to look up. As you can see, they're still hard to see because they're so high! They like to sit on top of that pole most of the day and just talk. Sitters are very rare creatures in nature - they live at such great heights that the few that exist don't get noticed too often. I don't know if you can tell from this far away, but sitters do not have any fur or hair on their bodies but they do have wings. They fly up to the top of that pole every morning, and then fly back down at night. Being mammals, sitters give birth to live young. 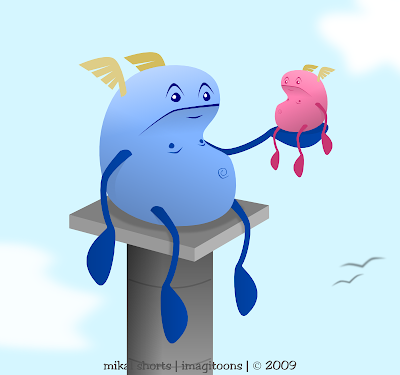 Baby sitters are born a gray-ish color and depending on what they are fed they become male (blue) or female (pink). Odd, huh? We'll give your neck a rest and move on to the next exhibit!